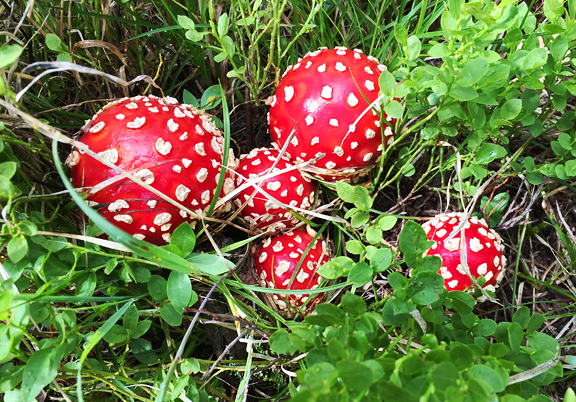 It’s getting to be ridiculous – all of these mushrooms popping up in the mountains! What I mean is that this summer’s mushroom flush is simultaneously wonderful and crazy. 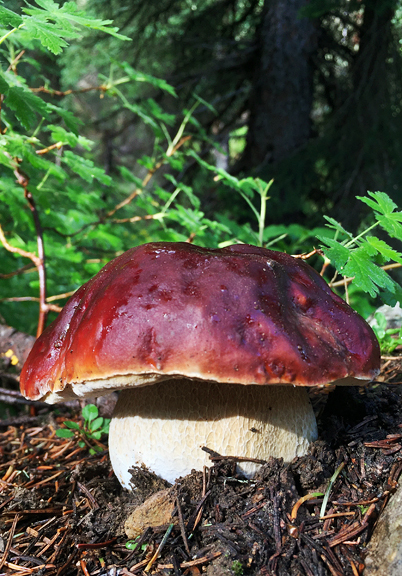 As a resident of the mountains, a good mushroom flush means we’ve been getting a nice helping of summer rains. Summer rains keep the wildfires at bay and instead of hearing “crunch crunch crackle” when you walk through the woods, it’s a softer sound underfoot indicative of the previous day’s afternoon showers. 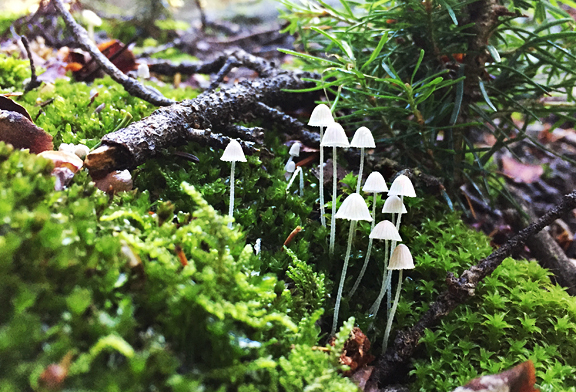 We are seeing so many varieties of mushrooms popping up that it’s hard not to marvel at the diversity of life. Diversity in a natural setting makes for a healthier whole. Diversity is important and holds greater value than our short-sighted human brains can possibly imagine. I don’t want just ONE kind of mushroom growing in my mountains. I don’t want ONE kind of corn to be grown on our farms. I don’t want ONE kind of dog to be raised in our society. And I definitely don’t think one race or gender or sexuality or religion should reign supreme in my country. As my favorite guy commented, “…a monoculture in any setting is weak, boring, sad, and lonely.” Diversity matters. 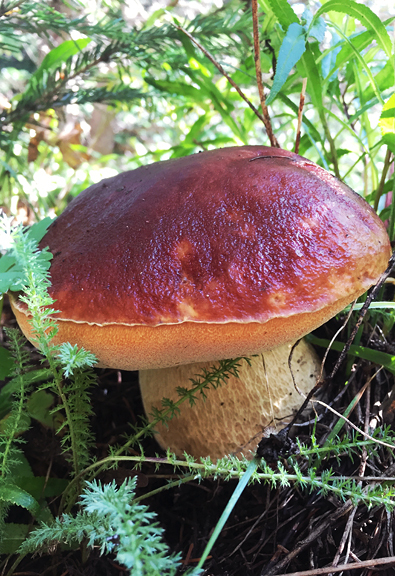 So far, it’s been a banner year for porcini and chanterelles and the season isn’t even close to being done! Last year was so dry and depressing that I was happy to observe any kind of mushroom popping out of the ground this summer. Sure, I am always snapping trophy shots of those mushrooms we covet (those choice edibles), but they are ALL beautiful and fascinating to me. I know a dozen edible mushrooms and a handful of poisonous or deadly mushrooms and then a few more species that fall somewhere in between (sort of tasty, not so tasty, taste terrible, can make you sick), but it’s quite amazing to happen upon a small patch of forest floor that is erupting in mushrooms, no matter the type. It’s good to see life flourish and thrive. Everybody plays a part, whether they (or we) know it or not. Summer is the season I recommend most of our friends come to visit us, because it’s the “nicest” weather and easiest passage in the mountains. But I’ve come to the conclusion that I should modify “summer” with “summer, except when the mushrooms flush”. 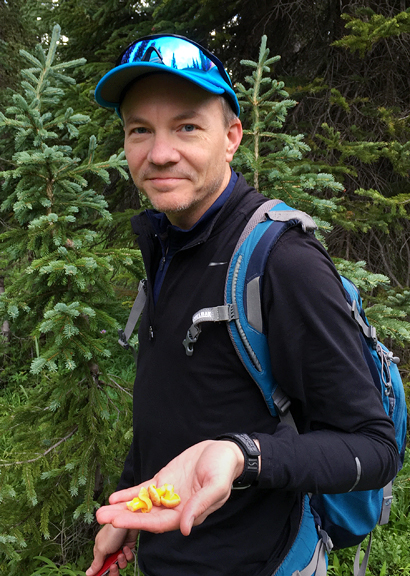 I know most people think mushroom season means you go for a leisurely hike, find some perfect mushrooms, skip back home, and cook up a gourmet feast to eat. I think that’s the dilettante’s way of mushroom foraging. No, we are a little more serious than that. We watch rain history, check old patches, recon on and off trail – and that’s all BEFORE the flush. Once the mushrooms go, it’s a bit of frenzy to cover a lot of terrain, collect responsibly, field dress (clean and cut out any wormy bits and worms), process the mushrooms at home (true cleaning and dealing with all the worms you didn’t get in the field), preserve (dry or cook/freeze), and in my case – test and shoot recipes. It feels like my life for the past three weeks has been all mushrooms, all the time. But it’s worth it when I pull a bag of chanterelles out of the freezer in February. But today’s recipe is best made with fresh mushrooms. I’m using fresh porcini here. You can use any mushroom you fancy. We’re going to beer-batter thick slices of porcini, deep fry them, and serve the slices in a taco. 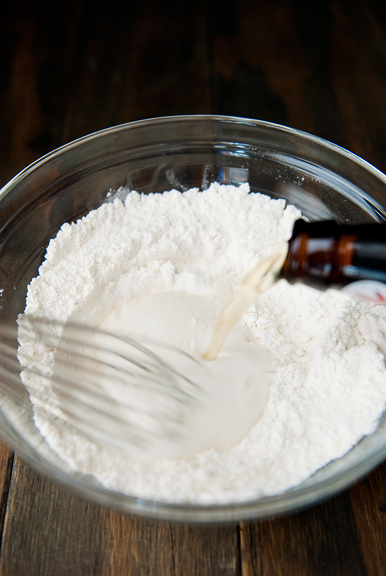 You could use milk instead of beer, but I really prefer beer in the batter – it makes for a tastier fry. Ready? Could you grill the mushrooms for a healthier version? Absolutely! However, the joy of finding a fresh, firm porcini is sort of cause for celebration and worthy of beer batter-frying the slices. The thing about mushrooms and frying is that mushrooms are 90% water. When I fried the slices, they went into the oil nicely enough, but then after a few minutes the loud splattering began because the mushroom slices began to release some water. This is totally okay if you have a splatter screen over your frying pot (you definitely want a splatter screen) and super scary/potentially dangerous if you have neither a splatter screen nor protective eyewear. The splattering dies down after a minute or so, but I want you to know what to expect – the better prepared you are, the fewer surprises and accidents. 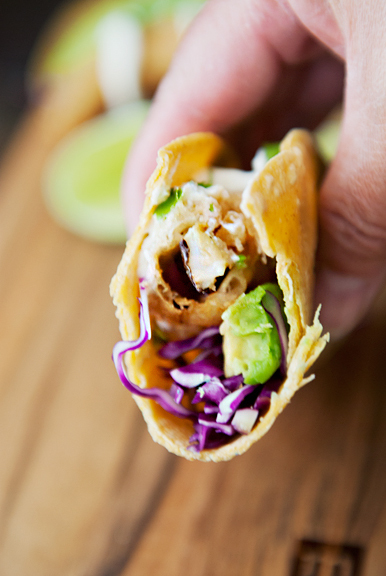 After the mushroom slices are fried, you can dress up your taco any way you like. I went with relatively mild-flavored ingredients like avocado and cabbage because fresh porcini has a delicate flavor that can be easily overpowered. 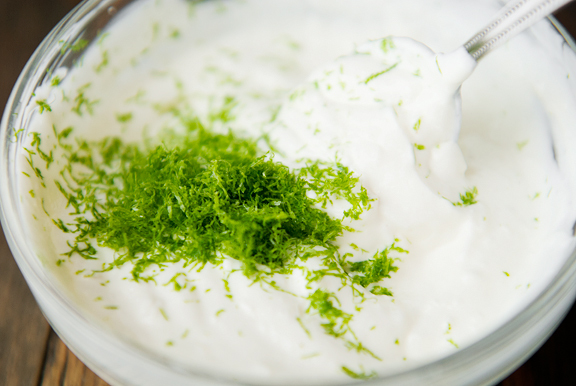 Instead of salsa, I opted for a garlic-lime crema that has nice zest and zing without stealing the show. It’s really simple to make and if you want to skip the tacos altogether, you can dip the mushroom slices straight into the crema and call it good. 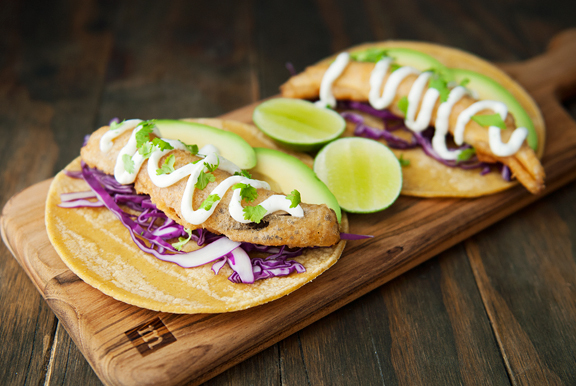 If you love fish tacos, these porcini tacos are right up your alley. The porcini are meaty and tender with that wonderful crisp beer-batter outside. 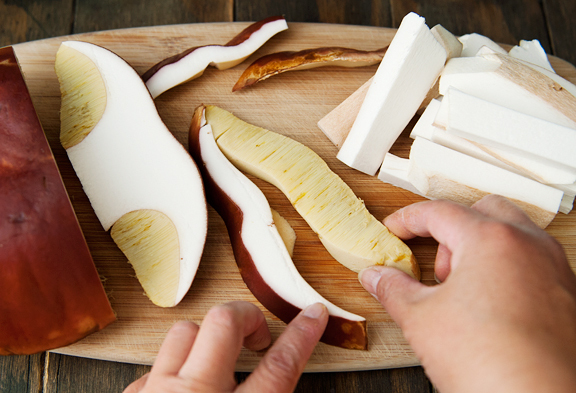 And because fresh porcini can be tough to get a hold of, feel free to substitute other fresh mushrooms (portabello is one option). These tacos can do double duty for Meatless Mondays or Taco Tuesdays, but really – they’re great ANY day. 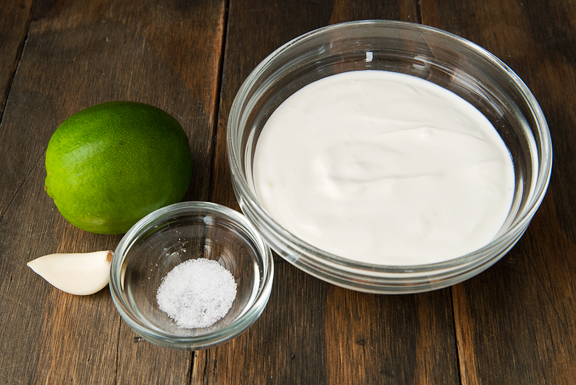 Make the lime crema: Mix all ingredients together. Make the porcini tacos: Heat 1-2 inches of vegetable oil in a large, deep pot (deep helps reduce the splatter) to 350°F. 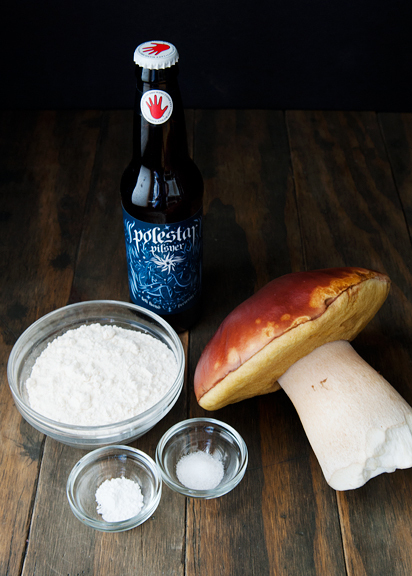 Slice your mushrooms into batons about an inch thick or whatever shape works with the type of mushroom you are using and set aside. 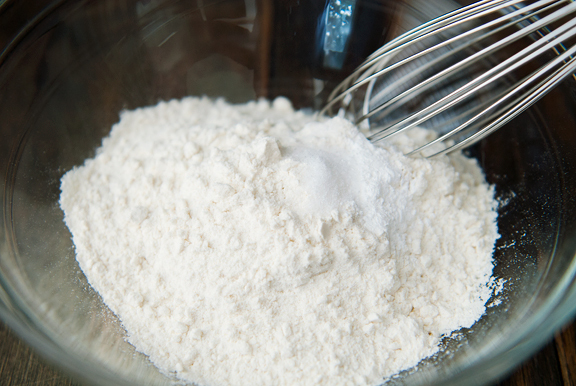 Combine the flour, baking powder, and salt in a medium bowl and mix together. 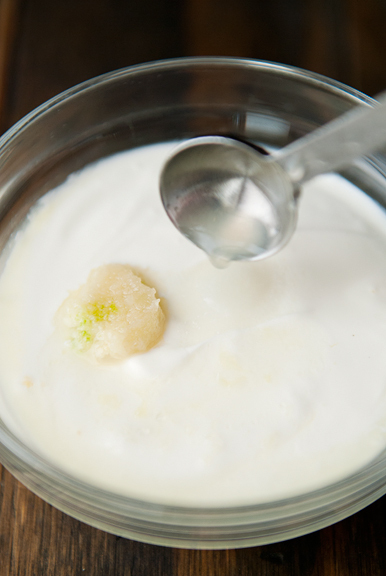 Stir the cold beer or milk into the dry ingredients until smooth. 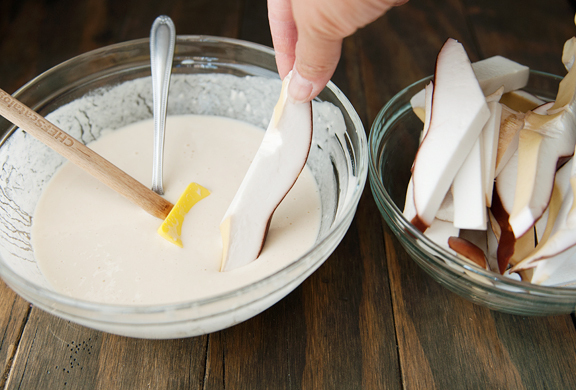 Dip the mushroom pieces into the batter and carefully drop into the hot oil. Fry for about 2 minutes, then flip and fry another 2 minutes until golden. 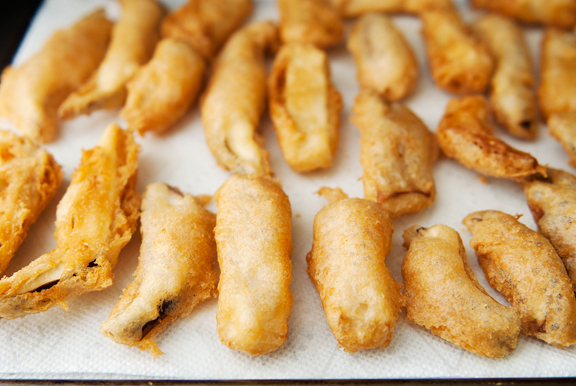 Use a splatter screen as the mushrooms can release liquid and cause a lot of hot oil to splatter. Remove to paper towels to drain. 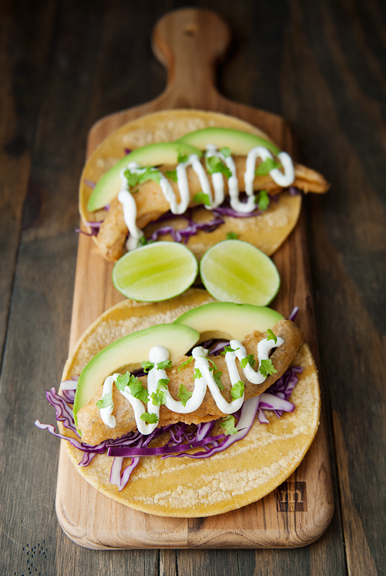 Serve with warmed corn tortillas topped with cabbage, avocado, cilantro, and garlic lime crema. Makes about 16 6-inch tacos. Thank Heaven for diversity! What a boring world it would be otherwise. Omg, that face on Neva as she’s sniffing your mushroom 😂 She is a clown! I balked at paying $24 for a pound of chicken-of-the-woods the other day, but when I read your post it finally sunk in how much time, energy and work is involved with mushroom gathering. Thanks for spelling it out so clearly! What a lovely way to remind us of the importance of and beauty in diversity. And darn it, you may make me fry again. I love fish tacos, but I love mushrooms even more. When I do this, I guess I will try frying up some avocado slices too. Don’t know when I will manage it, but my mouth is watering. Made the raspberry margaritas this past weekend for friends, and they were a hit! I am giggling out loud! what a stunning haul and Arturo is a magnificent beast!! Taco’s indeed! 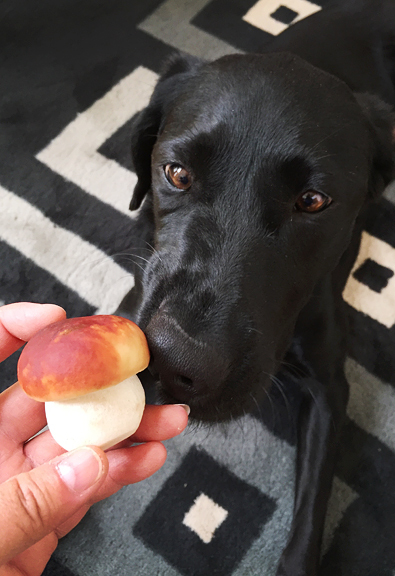 And that picture of Neva’s snuggly snoot sniffing that big ole shroom, nothing cuter! 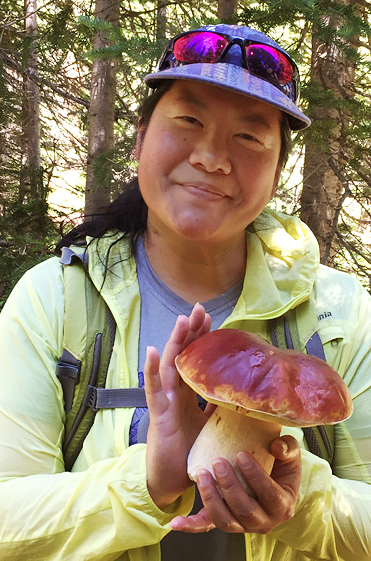 it’s funny that it just dawned on me that I thought I had seen that red mushroom before, maybe hiking here in NOVA & West Virginia on the Appalachian Trail, but then I remembered… that’s the shroom from Alice in Wonderland! Now I get it…. really stunning photos Jen. And, YES, YES, YAZZZ to Diversity!! I love the symbolism and your message. Living in Virginia, it was hard not to be drained over the weekend by the whole ugliness of events. Thank you for including the message in your post and for making me smile… I’m a sucker for puppies and shrooms. What a bland and boring world we’d be, without diversity. Your mushroom haul is amazing! And that poisonous red mushroom is so beautiful! Diversity is an essential blessing, and it appears that I’m not the only one among your faithful readers who appreciates your reminding us of this, Jen, and in such a special fashion. I can’t wait to find more porcini and make these sumptuous tacos! Meanwhile, when you say you cook/freeze them, does this mean it’s best to cook them before freezing or can you freeze them raw? Beautiful pics, I love your blog! How do you freeze the mushrooms, do you cook them first? I love so many of your posts, Jen, but I especially enjoy your mushroom ones! The porcinis you found are just incredible–worth the hard work you put into foraging! 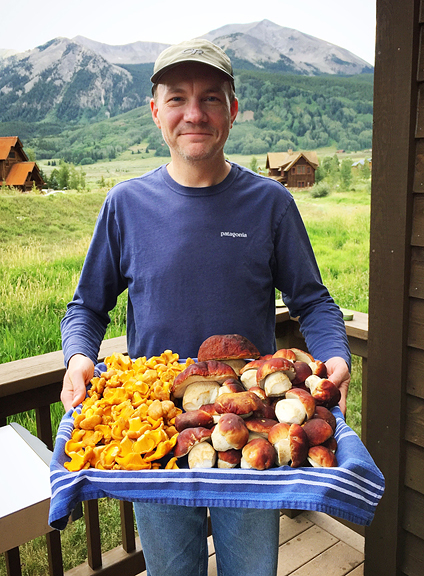 Really love the picture of Jeremy and your mushroom haul! And you with Arturo. And of course I agree about diversity (I’m Hapa, so how could I not? and a proud aunt to two Jewish Quapas) I truly hope that as dark as these days are for this country, they will be the nadir, and that eventually we as a people will become more evolved. It’s hard to imagine that happening right now, but we have to hope for it! At the very least…some of these old white supremacists should be dying off soon. That’s something. angelitacarmelita – I think it must have been particularly hard for folks in Virginia. Big hugs and glad the post could cheer you up! MK - Well, I think many foragers have different methods for preserving their porcini. I generally sauté in butter (but not salt) and then freeze in 4 or 8 oz. packages. Some people claim you can freeze fresh porcini. I have never tried it, but I'd like to if I ever get a vacuum sealer. Of course, drying the mushrooms transforms them into something intensely flavorful and practically a different beast altogether. So you can try one of several methods with success, I think. Debi Van Doren - I do cook them before freezing, but see my discussion with MK above about different methods.